Posted on November 20, 2018 at 9:35 am. During hot summer months, one simply can’t spend time outdoors trying to enjoy Mother Nature at her best. If it is too hot and humid, not only staying outdoors, but indoors too, becomes difficult. Then, our safe haven which is usually our home becomes more of a hellhole. To make lives comfortable and easy-breezy in the scorching summer heat, homeowners install air conditioners in their houses. Today, it is nearly impossible to live without an air conditioner. It has become more of a necessity for everybody. However, the excessive use of an air conditioner on a daily basis can make it exhausted over time. After all, an air conditioner is just a machine. It may break down or inhibit the production of cool air. Owing to these reasons, one must always consider an air conditioner repair in Cleveland, TN. 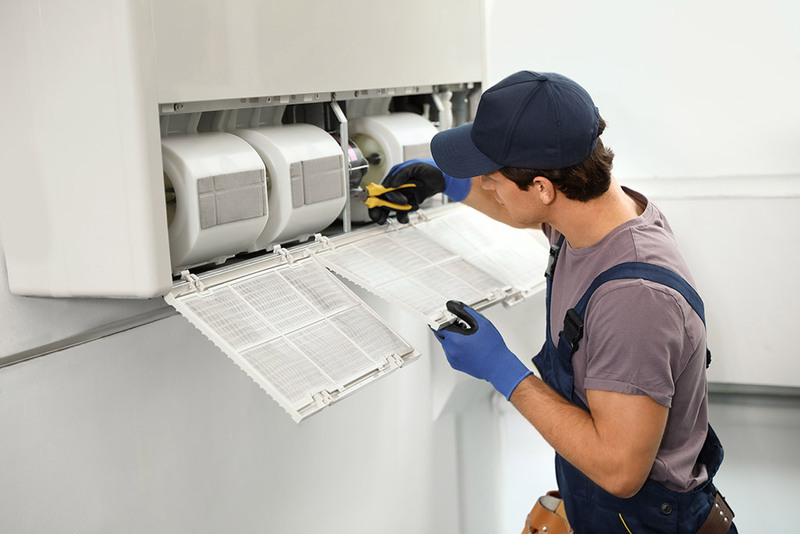 In order to know if your air conditioner needs repairing or not, you will need to look for the following signs. If your air conditioner has stopped producing cold air, you may realize it after some time. The poor performance of the air conditioner may not be apparent to you at once. At some point, you may realize that even setting the air conditioner at the lowest temperature, your air conditioner may not produce any cool air. You will notice that although the air is coming out of the air vent, it isn’t cool. This would be the major warning sign for you to consider an air conditioner repair in Cleveland, TN. This typically happens when the air compressor of the air conditioner stops working. Another reason for the lack of cool air is a low Freon level. In a situation like this, one needs to consider getting their unit replaced with a new one. Often times, the issue is not with an air conditioner as much as it is within the thermostat. To ensure that your thermostat is in a proper working order, you will need to check whether other rooms of your house are getting cooler. If you observe that they are not getting enough cold air, you will need to get an air conditioner repair in Cleveland, TN. Make sure that you opt for a reliable air conditioning company that can properly fix and replace the thermostat of the air conditioner. An excessive leakage or moisture around an air conditioner is not a good sign. To explain this occurrence, only two reasons make enough sense. Firstly, it could be due to a refrigerant leakage. You must know that a refrigerant leakage can be injurious to you as well as to your family. Hence, go for an air conditioner repair in Cleveland, TN as soon as possible. Otherwise, you may end up risking your loved ones’ lives. Another reason that could be the cause of water leaks is the water pools that are opposite the air conditioner have drains. They could be clogged due to excessive moisture that may emerge out of the air conditioner with time. This problem is not as big of an issue as the refrigerant one but it also needs to be resolved as quickly as possible. If you delay on addressing the issue, the mold may start to grow inside the tube. Usually, reduced air flow occurs when there is some problem with the compression unit. But if some rooms of your house are colder than other rooms, the problem may be in the ductwork. Whatever the case be, you must contact well-trained professionals for an air conditioner repair in Cleveland, TN to resolve the issue for good. Another reason for the poor air flow could be a high amount of debris accumulated in the air vent of your air conditioner. When there is an accumulation of excessive debris, the airflow is of poor quality, making the air injurious to your health. This is one significant reason why you must get your air conditioner checked on a daily basis. A well-functioning air conditioner would ensure a proper air flow. One of the major reasons for odd smells coming from your air conditioner is the smoldering wire insulation. Another reason could be the accumulation of excessive mold in the ductwork. Hence, it needs to clear up so that the foul smell could go away. Instead of doing it all by yourself, it is advised to consider an air conditioner repair in Cleveland, TN. To ensure that your home sweet home smells pleasant all the time, keep a thorough check on your air conditioner. Air conditioner repairs can cost you a lot. By having regular maintenance, you can save your hard-earned money from being spent on expensive air conditioner repairs. No one likes to be disturbed by unusual sounds coming from their air conditioner all the time. It simply disturbs the peace of your house. Such noises include grating, grinding, and squealing. All of these sounds may indicate that you may need to get an air conditioner repair in Cleveland, TN. If the problem is not fixed sooner, a huge breakdown may occur. The squealing sound may mean that the metal parts of the air conditioner need to be lubricated. The grinding noise may mean that the motor’s bearings are broken. In any case, you will need to get an air conditioner repair in Cleveland, TN. Are you experiencing any (or all) of these warning signs? Don’t worry then! Book the professional staff of Metro – plumbing, heating, and air and get all your air conditioner issues fixed in no time.